Screenshot via CNNFacebook CEO Mark Zuckerberg. Facebook CEO Mark Zuckerberg on Wednesday apologised for the data scandal that has roiled the social-media network this week. 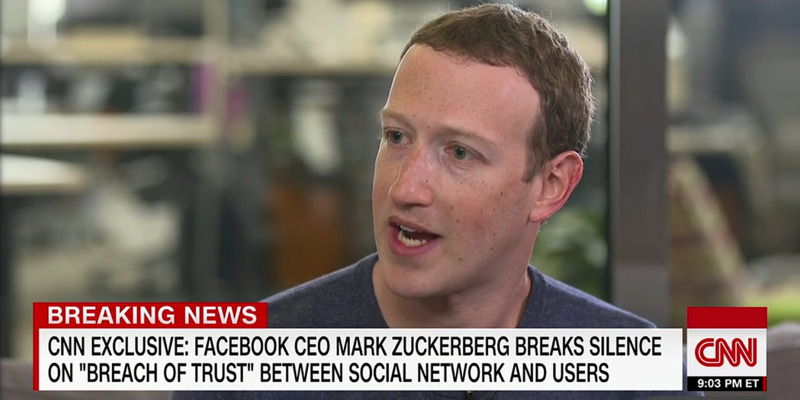 During an interview with CNN, Zuckerberg said he was “really sorry that this happened.” The interview aired hours after he and Facebook’s No. 2 executive, Sheryl Sandberg, issued their first statements about the scandal. It was revealed last weekend that the British data firm Cambridge Analytica inappropriately vacuumed up information from some 50 million Facebook users. Facebook’s stock has fallen 10% since Friday. Facebook CEO Mark Zuckerberg said he was “really sorry that this happened” Wednesday in his first interview on the massive data scandal that has roiled the social-media network this week. 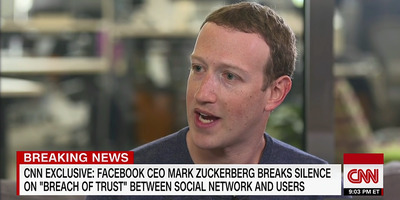 Zuckerberg made the apology on CNN hours after he and the company’s chief operating officer, Sheryl Sandberg, issued their first public statements on the matter. The British data firm Cambridge Analytica inappropriately used 50 million Facebook user profiles to target ads in support of its clients, including Donald Trump’s successful 2016 US presidential campaign. In the CNN interview, Zuckerberg said he regretted taking Cambridge Analytica at its word when it signed a legal document in 2015 certifying that it had deleted the information from those profiles – but had not. He also said he was willing to testify to Congress on the matter, though he would prefer to send someone with “the most knowledge” on any lines of questioning. He said he was open to the idea of regulating tech and was in favour of legislation around transparency in online advertising. Cambridge Analytica is being scrutinised over its actions during the 2016 campaign after an executive with the firm was recorded boasting about the firm’s ability to covertly target voters, entrap politicians, and launch propaganda campaigns. The reach of those operations was multiplied by connected platforms like Facebook. Russian operatives capitalised on this to a significant degree, sowing political discord among likely voters in a wide-ranging effort to meddle in the US election. Zuckerberg has acknowledged this in fits and starts after initially balking at the idea last year. And while he said he was “sure someone’s trying” to influence the 2018 midterm elections, he was also sure the company was better prepared to meet the challenge.